Our tanker and barge vessel spill kits are in compliance with the US Department of Transportation discharge removal equipment regulations for oil carrying vessels. The Oil Pollution Act of 1990 (33 CFR Part 155) or OPA90 requires oil carrying vessels in U.S. waters to have oil spill clean up equipment on board for on-deck spills. 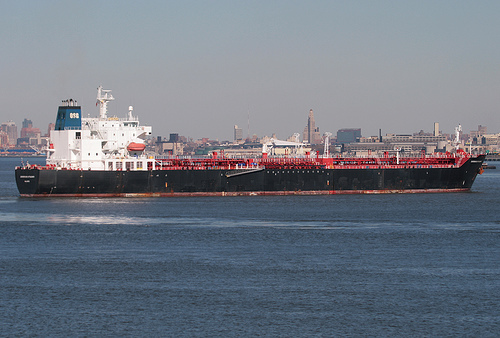 Oil tankers and barges with an overall length of 400 feet or more have an increased requirement of being able to clean up spills of 12 barrels (504 gallons). Vessels with an overall length of 400 feet or less, are required to be able to contain and remove on-deck spills of at least 7 barrels (294 gallons). Our vessel spill kits are a must for fast and effective clean-up. On-board vessel spill kits combining PetroGuard-D as an add-on as an oil spill solidifying absorbent are available on request. Add a 55-gallon drum of PetroGuard-D to your spill kits for an additional layer of safety. Please contact us about your vessel spill kit requirements. We build to suit! Nomenclature: (4) 95 gal Oil Only Yellow Spill kit, with screw top lid. Over-pack is X-rated and certified for shipping waste for Packing Groups I, II and III. Molded to allow forklift to move kit. Complies with UN Packaging Group 1 (X-Rating) and certified for use as DOT Salvage Drums, 49 CFR 173.3 (c). Wide, molded-in handles provide stability. Nomenclature: 5- 95 gal Oil Only Yellow Spill kit, with screw top lid. 40 CFR 112.7 Facilities subject to these regulations must have written plans in place discussing the products, countermeasures and procedures that are in place, or will be taken by the facility to prevent discharge of oil into waters of the United States.